Music students at The Sixth Form College, Solihull took part in a Music Conference from four professors at Bangor University last week. 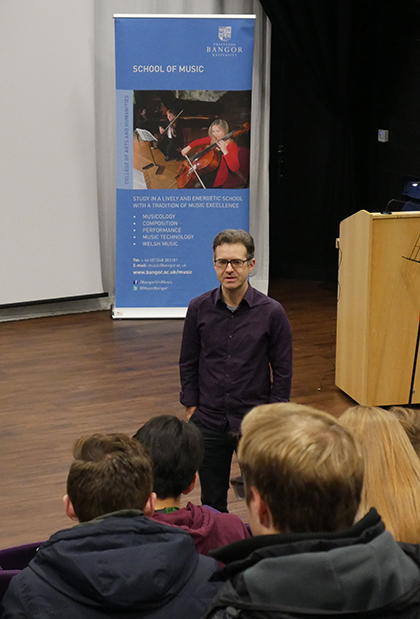 The first and second year A level Music and Music Technology students attended a series of lectures and workshops, including a Music Technology presentation from composer and lecturer Andy Lewis. There were also lectures tailored to the students’ set works and guidance on studying Music at degree level. The students got involved with workshops on performance and improvisation, all of which will benefit their A level studies in the future. The A level Music course includes elements of performing, composing and appraising music. 60% of the course is assessed by practical assessments during the course, with 40% coming from written exams at the end of the two-year course. Every year, we have students who progress to university to continue their Music studies.